I snapped this little jewel a few weeks back at the gas station just down the road from my office. In case you can’t tell what the gentleman in the picture is doing, he’s not trying to fish a bird out of the pump header. He’s not seeing how far he can reach with his stick, thereby one-upping his co-worker who currently holds the record with eight feet, two inches. Nope, he’s taking care of the details while cleaning up around the station. I watched as he took the pole, covered it with a dusting cloth, and proceeded to clean underneath the covering at the top of the pump. Can I tell you how many times I’ve looked underneath pump coverings? Zero. 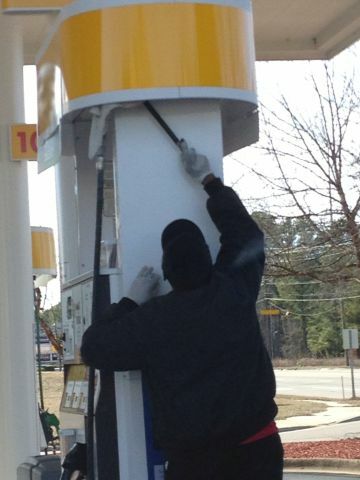 Not once in my forty 32 years have I ever given the white glove test at a gas station. But this guy has. And his work ethic is such that he believes cleanliness matters…details matter…even where no one else can see. How does that translate for our churches? Are we taking care of the tiny details when it comes to our facilities? Are we picking up the trash, even when it’s tiny trash? Even when it’s not our trash? Are we keeping our storage areas tidy, so it’s easier for us (or our volunteers) to find items we need? Are we noticing areas that others have long since forgotten to notice? Seeing my friend go the extra mile did more than just make me appreciate a clean facility. It caused me to appreciate the entire business. If he’s taking care of the details in a spot I’d never think to look, then he’s probably taking care of them in spots where I would. And that probably translates to a greater loyalty on my end. It’s a sad day for the evangelical church when a gas station attendant cares more about the details than we do. If the cleanliness of a gas pump matters, how much more should we clean up our facilities? Do the details matter at your church? The Disney Organization, recognized around the world as THE leader in exceeding Guest expectations, has one simple secret to their success: Details Matter. Thanks Danny, for reminding us that we don’t have to go to a Disney theme park to see excellence in the smallest details. Organizations all around us are “majoring on the minors” – details – and customers notice. Church leaders and volunteer teams should strive to do the same.